Barack Obama swept to an historic victory as America's first black president, but pleaded for time to heal and transform the superpower as he faced up Wednesday to the task of forging his promised change. "At this defining moment, change has come to America," Obama told 240,000 euphoric supporters, many in tears, at a rally late Tuesday after defeating Republican John McCain . Obama, 47, will be inaugurated as the 44th US president on January 20, and inherit an economy mired in financial crisis, wars in Afghanistan and Iraq and a nuclear showdown with Iran. "Even as we celebrate tonight, we know the challenges that tomorrow will bring are the greatest of our lifetime, two wars, a planet in peril, the worst financial crisis in a century," said Obama. "The road ahead will be long, our climb will be steep, we may not get there in one year or even one term, but America -- I have never been more hopeful than I am tonight that we will get there," Obama said in his home town of Chicago. "I promise you -- we as a people will get there." Senator Obama solidified traditional Democratic states and cut deep into the Republican territory which his rival needed to control to win the White House. Democrats also made huge strides in Congress, boosting their majority in the Senate by five seats, with results still pending in four states, and by 20 seats in the lower House of Representatives. Obama's win was greeted with euphoria across the United States and reverberated around the world . New York's Times Square exploded in joy and a screaming crowd gathered outside the White House. In Kenya, where Obama's father was born, President Mwai Kibaki declared a national holiday. Celebrations erupted from the bars of London and Sydney, with parties spilling onto the streets from Berlin to Havana and from Paris to the small Japanese town of Obama. McCain, the 72-year-old Arizona senator, was gracious in defeat after a bitter protracted campaign, acknowledging that the election of his rival was a moment to cherish for African Americans. "The American people have spoken, and they have spoken clearly," he said. "Though we fell short, the failure is mine, not yours," he told a crowd of supporters in Phoenix in his home state of Arizona. President George W. Bush who has been in control through eight turbulent years also congratulated Obama. "What an awesome night for you, your family and your supporters. Laura and I called to congratulate you and your good bride," White House spokeswoman Dana Perino quoted the president as saying in a phone call to Obama. Obama's inauguration will complete a stunning ascent to the pinnacle of US and global politics from national obscurity just four years ago. Obama is promising to renew bruised ties with US allies, and to engage some of the United States' fiercest foes such as Iran and North Korea. He has vowed to tackle climate change and ensure health care for all Americans. His presidency also marks a stunning social shift, with Obama -- the son of Kenyan father and white mother from Kansas -- the first African American president of a nation still riven by racial divides . Forty-five years after civil rights icon Martin Luther King laid out his "dream" of racial equality, Obama's election broke new barriers and may have helped heal some of the moral wounds left by slavery and the US civil war. When he launched his campaign on a chilly day in Illinois in February 2007, Obama forged a mantra of change which powered him through the longest, most costly US presidential campaign in history. His success looked likely after he captured Pennsylvania, a key battleground which was McCain's best hope of winning a Democratic state and keeping his rival from the White House. And in a sweet moment for Democrats, Obama also seized the key midwestern states of Ohio, Iowa and Indiana as well as the southwestern state of New Mexico, all states won by Bush in 2004. He later added Ohio, the decisive state which swept Bush to victory in 2004 and another Republican state, Virginia, which had not voted Democrat since 1964. He also won Florida, scene of the 2000 recount debacle. McCain had argued Obama was too inexperienced to be US commander in chief and would pursue "socialist" redistribution policies that would leave the economy mired in recession. As of early Wednesday he had won 28 states, including the district of Columbia, for 349 electoral votes. McCain had won 20 states but had not broken out of the Republican heartland and the south for 159 electoral votes. In the Senate, Democrats wrested control of five Republican seats including in the traditionally Republican state of Virginia, followed by New Hampshire, North Carolina and New Mexico. They reached a 56 seat majority in the 100-seat chamber but were unlikely to win the 60 seats they need for a filibuster-proff majority that would mean they could avoid Republican obstruction tactics. Democrats also won 20 seats in the House of Representatives, solidifying their majority to 258 against 177 of the Republicans, according to data from NBC news. WIN ONE OF THE MOST ANTICIPATED US PRESIDENTIAL RACES FOR DECADES. PROFILE: BARACK OBAMA WILL HE BE THE NEXT US PRESIDENT? READ HIS PROFILE AND SHARE YOUR VIEWS. ELECTION IMAGE GALLERY TAKE A LOOK AT OUR IMAGE GALLERY OF REACTIONS TO OBAMA'S VICTORY. HOW ELECTION DAY UNFOLDED TAKE A LOOK AT HOW BARACK OBAMA BECAME THE 44TH US PRESIDENT. PROFILE: JOHN MCCAIN WILL HIS EXPERIENCE PROVE VITAL? READ HIS PROFILE AND SHARE YOUR VIEWS. FROM THE BARS OF LONDON TO THE SMALL JAPANESE TOWN OF OBAMA, IT SEEMED LIKE THE WHOLE WORLD TUNED IN WEDNESDAY TO SEE BARACK OBAMA WIN ONE OF THE MOST ANTICIPATED US PRESIDENTIAL RACES FOR DECADES. ASPIRING ENTREPRENEURS BASED ON THE ISLE OF MAN HAVE HIRED NASA TO HELP WITH THEIR LATEST PROJECT. » WHAT'S THE PLAN? FULL US ELECTION COVERAGE REACTION, VIDEOS AND PHOTOS FROM ELECTION NIGHT. POLITICAL PERCEPTIONS READ OUR FIVE-TIMES-A-WEEK US ELECTION BLOG WRITTEN BY THE WALL ST JOURNAL'S EXPERT TEAM. US ELECTION ANALYSIS FROM THE WALL STREET JOURNAL'S WASHINGTON BUREAU. Barack Obama has said "change has come to America" on becoming the first black President of the United States. "It's been a long time coming. But tonight, because of what we did on this day, in this election, at this defining moment, change has come to America," Mr Obama told 100,000 supporters, as he took his victory bow with his family. "A new dawn of American leadership is at hand. To those who would tear the world down, we will defeat you. To those who seek peace and security, we support you." Sky's Michelle Clifford, at the election party in downtown Chicago, said: "It really does feel like the whole of Chicago is cheering... you really do feel like you're taking part in history." Mr Obama's hometown has embraced his landmark victory as a dream finally come true. "Today I am proud to be a black American... This is a wonderful, wonderful, wonderful day," Obama supporter Rosemary Morris said. But at the McCain camp in Arizona, Sky's Robert Nisbet said there are "many sad faces among the Republican faithful". In a gracious concession speech, Mr McCain said his camp had "fought as hard as we could and though we fell short the failure is mine not yours". The crowd responded with chants of "John McCain" and "You're not done". Mr McCain went on: "I urge all Americans who supported me to come together and bridge our differences to restore our prosperity, defend security and leave our children and grandchildren a better world than ours." The writing was on the wall for Mr McCain after Mr Obama clinched the key states of California, Virginia, Ohio and Pennsylvania. Mr Obama led his rival by 338 votes to 141 as he passed the magic number of 270 needed to win the presidency. The two senators campaigned right up to Election Day, as a record number of American citizens from all 50 states cast their ballots. Mr Obama also captured Michigan, Minnesota, Rhode Island, Wisconsin, Delaware, Maine, New Jersey, New Hampshire, New York, Maryland, Massachusetts, Connecticut, Vermont, Washington DC and Illinois. Mr Obama, 47, son of a Kenyan and white mother from Kansas, will be sworn in as the 44th US President on January 20 next year when he takes over from President George Bush. He will face a series of challenges over the next four years, including the economic crisis, the wars in Iraq and Afghanistan, and an overhaul of the US health care system. From the White House, Mr Bush made personal phone calls to Mr Obama and Mr McCain soon after the result. To Mr Obama, he said: "Mr President-elect, congratulations to you. What an awesome night for you, your family and your supporters. To Senator McCain, he said: "John, you gave it your all. I'm proud of you, and I'm sorry it didn't work out. You didn't leave anything on the playing field." Meanwhile, the Democrats have regained control of the Senate - an important step towards their goal of a so-called "super majority" in the three branches of the US government. Barack Obama has promised to "change the world" if he is elected US President. With just three days to go he and his opponent John McCain are touring key states in an effort to woo undecided voters. Senator Obama is still almost seven points ahead in the Real Clear Politics poll of polls, but the gap has narrowed slightly. At a rally in Henderson, Nevada, he warned his supporters against complacency. "At this defining moment in history, you can give the country the change we need," he said. Sky News' Michelle Clifford, who was at the rally, said Mr Obama was trying to leave nothing to chance. "He'll be using every ounce of his resources to get the vote out," she said. At the same time Senator McCain was rallying his followers in Newport Beach, Virginia. In a usually safe Republican state, which is threatening to go to the Democrats, he asked for help on the home stretch. He said: "Let me state the obvious again, we need to win Virginia on the fourth of November and with your help we're going to win and bring real change to Washington. The campaigning has been tough for both men, but Sky News' Robert Nisbet, who has been following the McCain bandwagon, says the toll is beginning to show on the older man. "Being on the road at rally after rally is exhausting and Mr McCain appears to be tired," he said. Senator John McCain delivered a gracious speech acknowledging his US presidential defeat and attracting boos from his supporters. Delivering his speech in Arizona he said: "My friends we have come to the end of a long journey. The American people have spoken and they have spoken clearly. But he had to pause during his next line, saying "please" to the crowd, as he said he had called "Senator Barack Obama to congratulate him". With wife Cindy and running-mate Sarah Palin at his side he continued: "In a contest that has been as long and difficult as this one has been, his success alone commands my respect for his ability and perseverance." He tried to bolster his supporters who lost not only the election but influence in Congress and said: "It is natural, it is natural tonight to feel some disappointment, but tomorrow we must move beyond it and work together to get our country moving again. "We fought as hard as we could though we fell short, the failure is mine not yours." He also passed on his sympathy at the death of Mr Obama's grandmother and said: "Senator Obama has achieved a great thing for himself and for his country. I applaud him for it and offer him my sincere sympathy that his beloved grandmother did not live to see this day." John McCain has admitted defeat - and the venue for his climb down was what used to be his lucky hotel, the Arizona Biltmore. Amid its lush palm trees and manicured lawns, he married Cindy here in 1980 and, earlier this year, toasted his success in the Republican primary. But on November 4, 2008, the hotel hosted the demise of his presidential ambitions. The evening started cheerfully in the ballroom, with hundreds of the party faithful entertained by an eclectic musical programme of choirs, an Apache ceremonial dance and Hank Williams Jr. The master of ceremonies, the former Governor Buddy Roemer of Louisiana, told the crowd, supplied with red pom-poms and alcohol, that he would regularly update them as results came in from around the country. His first announcement raised a cheer: "Kentucky for McCain!" But as the losses mounted and battleground states started falling, the Republican National Committee's electronic scoreboard was switched off. Instead, they turned up the volume of the band, as if to drown out the bad news. Mobile phones became the main source of information for the crowd, but the whole room became aware the game was up, when Governor Roemer told the guests to gather on the lawn to hear an address by John McCain. Chaos ensued as people struggled to get through security gates in time. The maverick ticket eventually emerged, Sarah Palin uncharacteristically silent. The veteran scrapper, moist eyed and clearly tired from the exertion of the final push, was gracious in his concession. "Senator Obama and I have argued our differences and he has prevailed," he said. "No doubt many of those differences remain. These are difficult times for our country. And I pledged to him tonight to do all in my power to help him lead us through the many challenges we face. "I urge all Americans who supported me, to join me in not just congratulating him but offering our next president our good will and earnest effort to find ways to come together." "We fought, we fought as hard as we could, and though we fell short, the failure is mine and not yours," he said to boos from the crowd. "I am so deeply grateful to all of you for the great honour of your support and for all you have done for me. I wish the outcome had been different my friends." But his appeal to party officials to reach across the divide fell on deaf ears within his own campaign. When President-elect Obama took to the stage in Grant Park, the big screens in the ballroom were switched off as he opened his mouth to deliver the historic address. Deprived of such a momentous moment, journalists gathered around any monitor glowing with TV news networks' live coverage of the speech. As they filed from the room, the disappointment after such a long, hard fought battle was etched on the faces of Senator McCain's supporters. At 72, it's unlikely John McCain will attempt another White House dog-fight. Could his divisive running-mate Sarah Palin pick up the baton for 2012? "Fareed Zakaria: GPS" on CNN at 1 p.m. ET Sundays. and corruption on the left and the right. Fareed Zakaria gives his reaction to the presidential election. In his victory over John McCain in the U.S. presidential election Tuesday, Barack Obama snared about 65 million votes to McCain's 57 million. "I think what we see ... is a new coalition, a new order emerging. It isn't quite there, but with Barack Obama, for the first time, it's won. It is the Latino vote, it is the bigger black vote that came out. Very importantly, it's the youth vote, the 18- to 29-year-old," said the Harvard University professor and former presidential adviser. 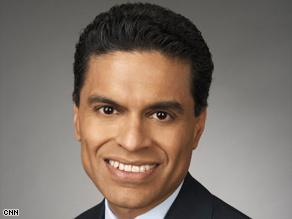 CNN spoke to world affairs expert and author Fareed Zakaria about the Obama victory. NEW YORK (CNN) -- In his victory over John McCain in the U.S. presidential election Tuesday, Barack Obama snared about 65 million votes to McCain's 57 million. CNN: Was this a transformative election? Zakaria: Many people have been discussing it from a racial perspective and although that is true, I think it is larger than that. I think President-elect Obama has the chance to realign the political landscape and to create a governing ideology for the West. CNN: Doesn't that seem like a grand ambition? Zakaria: It is not only ambition, but a result of the times. Conservatives have dominated Western politics for the last three decades because they proposed solutions to the problems of the 1970s -- slow growth, social unrest, and Soviet adventurism. But those solutions don't work anymore. They don't address the problems of today -- an out-of-control financial system, rising inequality, unaffordable health care, poor infrastructure, a broken energy policy. CNN: Isn't what you're describing then a return to the left? Zakaria: Not really, the world has moved on from the 1960s. Few believe that the government should own the commanding heights of the economy, that central planners should allocate resources and that protectionism will save jobs in the long run. Look at the left in power, from Britain to Australia, and you see pro-market, pro-trade policies aimed at promoting growth. The difference is that they also encourage government efforts in certain areas where the private sector isn't sufficient. CNN: But there is still an American distrust of government -- which is why Americans have moved to the right. What are your thoughts on that? Zakaria: I think the greatest problem most Americans have with Washington is they see their government as predatory and corrupt. They look at the tax code and worry less that it "spreads the wealth" than that it institutionalizes corruption through loopholes and special deals. True reform will mean attacking predatory policies and corruption, from the left and the right. President-elect Obama must recast the traditional divide in American politics. Rather than the usual left-right split over the size and role of government, make it a bipartisan effort to combat corruption. CNN: What president do you see President-elect Obama emulating? Zakaria: In the early 1930s, economic and political realities also suggested that the United States was poised for a new era. But such an era happened and took the particular shape it did only because of the skill and ambition of Franklin Delano Roosevelt. If he truly wants to mold the future, Obama will have to demonstrate similar leadership. However, I do believe he has the ability and the challenges to be another FDR. Not scary, rather funny and just a little bit fabulous.